As bastion after bastion of resistance to the British crumbled during those chilly nights of the winter of 1858, Lucknow steadfastly put up a brave front. Here there was no organised army led by the local ruler — for just a year ago he had been unjustly overthrown and his kingdom of Awadh annexed. 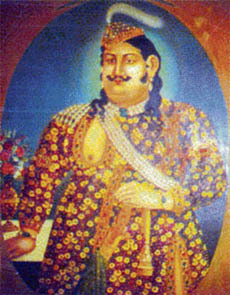 The last poet-ruler of Awadh, Wajid Ali Shah, had reluctantly left his capital in Lucknow for faraway Matia Burj on the outskirts of Kolkata on 7 February 1856. A stunned populace bid a tearful farewell to the distraught king. His grief had distilled into an exquisite poem equating his parting from Lucknow to a bride’s departure from her natal home. "Babul mora nahiyar chhutohi jaye". The song still mesmerises millions who know little about its origin. This unique monarch has the distinction of ruling over the hearts of so many ordinary Indians even a 150 years after his abdication. On 4 February 1856 quite unexpectedly the then Lucknow Resident General Outram, who was also the chief commissioner of Lucknow had served a document to the king which he had received from Governor General the Marquis of Dalhousie. The common citizens of the city remained a mute witness to the humiliating abdication of their king. For them the Residency became the symbol of the unseen British Empire that had in the blink of an eye become their new ruler. As if this was not enough, Outram apprehensive of the popularity of the king chalked out a strategy to systematically destroy the possessions of the royal family. An order was issued to sell the ex king’s personal possessions in a public auction and send the proceeds to the governor general. According to Tarikh-e-Oudh by Najmul Ghani "...700 animals, 200 elephants, 2000 horses, 107 camels, 2 lakh pigeons and 107 lions were auctioned at Kothi Dil Aram in the month of April and May 1856 for crores of rupees". It became a routine for British forces to forcibly enter any of the royal residences on the pretext of looking for public documents and loot whatever they could lay their hands on. 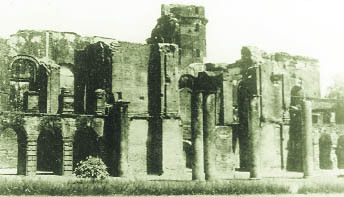 Judicial Commissioner Ommaney not only ordered the looting of Moti Mahal, one of the palaces, but also the eviction of its royal inhabitants. The people of Lucknow were a silent witness to all these developments. As an expression of their anguish they decided not to celebrate Holi and Nauroz that incidentally fell on the same day of Friday 21 March that year. The departed king’s elder brother gave a sermon after the Friday prayers not to obey orders of the firangis that stirred the people and alerted the East India Company. Anger against the British was simmering. Every day brought some new horrifying news that infuriated them further. Architectural gems were being demolished to widen road. Even the house of famous poet Mir Taqi Mir was not spared and razed to the ground to lay the railway line. One particularly insensitive act that left the local people aghast was the using of a revered religious shrine Qadam Rasul as a warehouse to store gunpowder. The building was regarded to have the footprints of Prophet Mohammad etched in stone. During the uprising the place became one of the sites of a bloody battle with the British forces. The alluring offer of the British to the king’s ex soldiers to join the British army worked like ignition — an offer that these men saw as an act of provocation as for them it was anathema to join hands with the British who they believed had robbed their ruler of his kingdom. The royal library having more than three lakh rare books, including the ex king’s personal collection, was shifted to Cluade Martin’s Kothi where it became private property. The people of Lucknow no longer had any access to it. Similarly provocative was the order of disarming of 574 forts of taluqdars and zamindars (feudal lords) of Awadh. With a few exceptions, all these feudal lords were loyal to the ex king and vehemently opposed these orders to render them vulnerable to the British forces. Needless to say none of this endeared the British to the local people who started viewing the Residency as an emblem of their humiliating subjugation. Residency was, in fact, the spacious complex housing the British offices and residence of officers. Many British civilians also preferred living there making it an island in itself. To channelise this simmering anger of the people of Lucknow and organise them into a force to fight against the East India Company Nana Saheb of Bithur accompanied by his secretary and adviser Azim-ullah Khan reached Lucknow on 18 April 1857 to consult Begum Hazrat Mahal, one of the queens of the departed king Wajid Ali Shah. Mirza Bahadur Bakht, the grandson of the Mughal emperor Bahadur Shah Zafar also arrived at Lucknow and contacted Nana Saheb. Third of May 1857 is considered to be an important day in the history of Lucknow as the uprising of 1857 in Awadh began with the mutiny of the sepoys of the 7th Regular Infantry Regiment at Marion Cantonment in Lucknow that day, almost a week ahead of the uprising of 11th and 20th native cavalry of the Bengal Army in Meerut on 10 May which is taken as the signalling of the First War of Independence. In no time an army revolt turned into a general uprising of the people of Awadh as news spread like wild fire from district to district. As Awadh was ablaze with army rising in protest and common citizens coming to their aid the success of Nana Saheb’s troop at Kanpur and progress towards Lucknow in the last days of June 1857 filled the city with renewed hope. The former Awadh army under leadership of Begum Hazrat Mahal comprising the forces of the local rajas and taluqdars attacked Lucknow on 30 June 1857 and defeated the British army under the command of Sir Henry Lawrence in a decisive battle at Chinhat on the outskirts of the city some eight miles from the Residency. By evening Lawrence and his forces, along with many European civilians took refuge inside the Residency that lasted for close to five long months. The British commander of Lucknow, Henry Lawrence, had enough time to fortify his position inside the Residency compound. His forces numbering some 1700 men, included loyal sepoys. The Awadh forces’ initial assaults were unsuccessful, and so they began a barrage of artillery and musket fire into the compound. Lawrence was one of the first casualties. The local forces tried to breach the walls with explosives and bypass them via underground tunnels that led to underground close combat. Shell marks on the walls of the ruins of the Residency are preserved to this day telling the story of valour of the common people. Resistance lingered on till the second battle fought in March 1858 at Alambagh and other places in Lucknow. Here the Awadh forces were routed and Begum Hazrat Mahal escaped to Nepal. She did not surrender to the British till her death in Nepal on 7 April 1879. For the British the restoration of the Residency was the reestablishment of the symbolic supremacy of the British Empire. In the post-1857 years the Lucknow Residency was the only building in the British Empire where the Union Jack was not taken down at sunset. It was also the only building where British authorities hurriedly removed the Union Jack on the evening of 14 August 1947, however before the midnight hour apprehending some undeclared act of vengeance at the hands of the common people.